The European accountancy profession is confident on its ability to tackle technological changes and does not see technology as a threat, according to a survey by Accountancy Europe. Thirty six European accounting institutes responded to a survey by Accountancy Europe who published the result in a report entitled, The Technology Barometer. Of the 36 institutes, including ACCA, ICAEW and CIMA, each sent an individual answer based on the average answer of their participating members. The survey results revealed that the majority of Accountancy Europe’s members are positive about the important role of technology as none identified technology as a threat. One third of respondents believed that technology is an opportunity to reinvent the profession and more than half (56%) thought it is an opportunity to improve accountancy services. Yet, 42% of respondents agreed that technology constitutes a serious challenge that will require significant changes. The report looked at the technology work the participating institutes are currently doing, of which 78% of respondents are carrying out technology related activities. The most widespread areas of technological activity included training, product and services development and organising conferences. Compared to more than five years ago, technology related activities and services have dramatically increased, and in some cases have more than quadrupled according to the report. 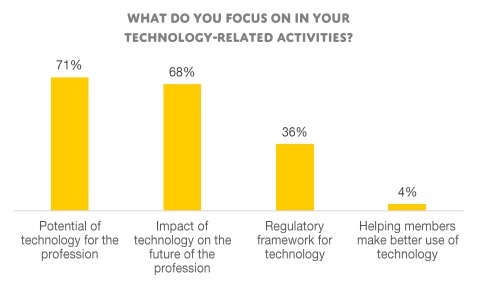 The activities were mostly focused on the potential of technology and the impact on the future of the accountancy profession, yet few respondents took a practical approach by helping their members make better use of technology, which is seen as one of the biggest challenges. The most common support of technology related activities was through the dedication of existing internal staff (61%), even hiring specialised internal staff (32%), yet some institutes even used external expertise such as consulting (36%) or partnering with specialised technology firms (29%). The survey report reveals the profession’s optimism at time when the latest technological advancements have led to concerns about the impact of technology on the accountancy profession, such as the issue of automation. Accountancy Europe took the opportunity of the survey to ask its members what they expected from the European federation. Respondents expressed the need for Accountancy Europe to provide support for them to be ready for technological change. Respondents indicated from 0 – 100, with an average of 78, on how important it is for Accountancy Europe to become more active in the technology field. Most respondents indicated that they would like Accountancy Europe to facilitate cooperation of best practices, provide information on recent developments, and interact with legislators. Graphs acquired from Accountancy Europe's report.